After sealing the series in the previous match, India A ended the ODI Series by beating New Zealand A by 75 runs in the third unofficial One-day match played at Mount Maunganui. With this, they have also whitewashed hosts 3-0 in the series. India A captain Manish Pandey won the toss and decided to bat first. Ishan Kishan and Anmolpreet Singh gave the visitors a great start adding 68 runs for the opening wicket in 13.5 overs. Ishan Kishan was dismissed for 38. Shreyas Iyer made 23 while the centurion from the last match and captain Manish Pandey only scored only five runs. Anmolpreet Singh scored 71 off 80 balls and gave a solid foundation for a decent total. Anmolpreet Singh and Ankit Bawne steadied the ship adding 64 runs for the fourth wicket. Bawne made 48 off 49 balls while Vijay Shankar scored 42 off 43 balls. Axar Patel scored a quick fire 31 off 29 balls and added 58 runs for the sixth wicket with Vijay Shankar helping India A score 275 for 8 in 50 overs. Chasing the target of 276 runs to win, George Worker and Rutherford put on 34 runs for the opening wicket in 7.1 overs. The Indian bowlers did not allow New Zealand to score runs easily and picked wickets at regular intervals. New Zealand A wicketkeeper-batsman Tim Seifert was the top-scorer with 55 runs. India A bowled out hosts New Zealand A for just 200 runs in 44.2 overs and registered a 75-run win. 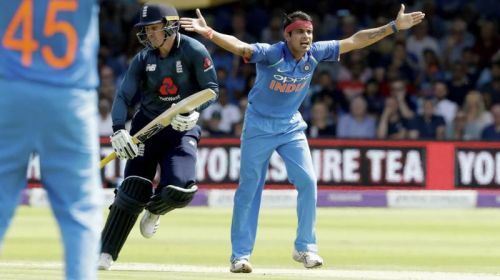 For India A, Siddarth Kaul was the pick of the bowlers with figures of 4 for 37, K Gowtham took two wickets while Khaleel Ahmed, Axar Patel, Krunal Pandya and Vijay Shankar took 1 wicket each. Brief scores: India A 275 for 8 in 50 overs (Anmolpreet Singh 71, Ankit Bawne 48, Ishan Kishan 39, Seth Rance 3/49) beat New Zealand 200 in 44.2 overs (Tim Seifert 55, Daryl Mitchell 30, Siddarth Kaul 4/37, K Gowtham 2/40) by 75 runs.